Compete in UI Prototype challenges on a platform that allows up-and-coming coders to step into the spotlight-giving them the chance to break into the industry in front of peers, experts in the field and real world Fortune 500 clients. Compete in all types of development challenges to win prize money and establish your street cred. Sharpen your skills and learn new technology while working on real world projects for big-name clients. 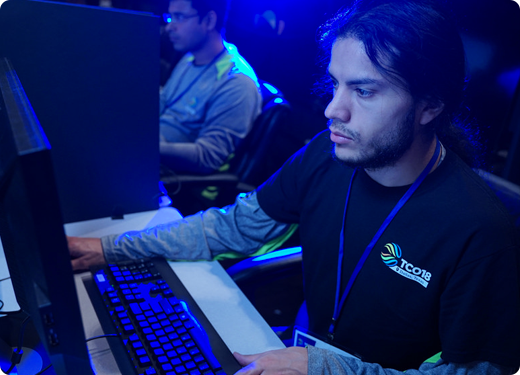 The 2018 Topcoder Open UI Prototype Competition will take place in four (4) online stages. The top three (3) performers, per the leaderboard, of each stage from the UI Prototype Competition will win a prize and/or a trip to compete in the TCO18 Finals in the USA on dates and a location to be determined at a later date. During each Stage, Contestants who participate in Tournament-eligible UI Prototype Competitions on the Topcoder website will receive points for that Stage as outlined in these Rules. Only Tournament-eligible UI Prototype Competitions in which registration has opened during the four (4) Stages shall be included in determining points for that Stage. All Tournament – eligible UI Prototype Competitions will be clearly marked on the active challenge listing page. Scoring in the UI Prototype Competition is determined based on the final ranking for a Contestant’s submission in a Tournament-eligible UI Prototype Competition (as applicable) in accordance with the rules of such competition. Upon the completion of all Tournament-eligible UI Prototype Competitions, the individual scores that a Contestant receives during all Stages will be added for a cumulative score. All final fixes will be completed according to the schedule specified for the applicable Prototype Competition. On a case-by-case basis, as determined by topcoder personnel, placement points may be deducted for failing to complete final fixes on time. The tied Contestant with the highest number of first place submissions will receive a higher placement in the Prototype Competition in that Stage. If a tie still remains, then the remaining tied Contestant with the highest number of second place submissions will receive a higher placement in the Prototype Competition in that Stage. If a tie still remains, then the remaining tied Contestant with the highest number of third place submissions will receive a higher placement in the Prototype Competition in that Stage. If a tie still remains, then the remaining tied Contestant with the highest number of fourth place submissions will receive a higher placement in the Prototype Competition in that Stage. The tied Contestant with the highest number of first place submissions across the Prototype Competition Stage will receive a higher placement in the Prototype Competition. If a tie still remains, then the remaining tied Contestant with the highest number of second place submissions across the UI Design Competition Stage will receive a higher placement in the Prototype Competition. If a tie still remains, then the remaining tied competitor with the highest number of third place submissions across the Prototype Competition Stage will receive a higher placement in the Prototype Competition. If a tie still remains, then the remaining tied competitor with the highest number of fourth place submissions across the Prototype Competition Stage will receive a higher placement in the Prototype Competition. Prior to Contestants receiving their cash prize, they must complete all work for all underlying UI Prototype Competitions and Tournament and UI Prototype Competition-related work, such as final fixes.